That's a good idea! I hadn't thought of that. Oh my gosh! I thought you'd made the castle thingy up! Yeah! There's tons of good graphic makers out there (Namely, myself) who make that sort of stuff! I'm personally disappointed at the lack of Kiki Strike Fanart (Lookl it up on Deviantart. Only like three pictures. You wanna make some wallpaper? I can send you illustrations. Technology isn't my strong suit. I was wondering if it was real. :) cool. Wow. You guys are amazing. I'll send you some in a bit, Erin. I'll try my hand at some as well, if that's okay? Exactly! By the way. lena is me as well. I am just too lazy to sign in at times. When does kiki strike 3 come out? You are very intrguing, Mr. H. How do you know I'm not Ananka? Who is Ananka? Who is Kirsten Miller? These are the big questions! "Mr. H" is my brother. I wonder what book 3 will be called!!! Yuck... i ate a piece of chocolate from Christmas '06 or '05. Maybe '04... It was good! Why am i sharing my chocolate secrets with the world? LOL. That is so cool. I have GOT to move to NYC! You're so mean! Why do you tease us so? jk! So yet again i have started a stir. My little wallpaper fad has taken off! I am very conceited arent't I? ha! Anyways, Lena, how do you make stuff a.k.a. desktop/wallpaper using illustrations? I know how to do many things on the computer, but that is one I never learned how to do. What application do you use? Chocolate is good, even if you found it in a treasure chest with rusty hinges in you back yard. *Yawn! * It's 7 in the A.M. Thanks for checking in Mr. H.
Spring, you and your brother are a fabulous comedy team! Too bad. You should have been there. you terrible teaser! Weren't you and kiki in a little dingy in the river? Kirsten? on the front page it says: kiki strike: inside the shadow city afganistan, um it doesn't SEEM like it should say "afganistan"
John, I already pointed that out! Very cool. I'll have to rent my boat and explore the grounds. Why are we talking about Afganistan, wallpaper, and old chocolates??? lolz. Oh! By the way, can I have an image of the Kiki Strike cartoon when she's with the Vespa. Blogger said I was located in Afghanistan, which hasn't been true for quite some time now. As for the wallpaper--if we have it, it's yours, Annemarie! 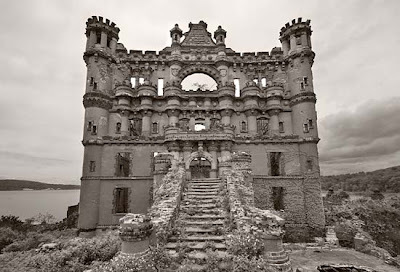 Yep, the Bannerman Island is real. 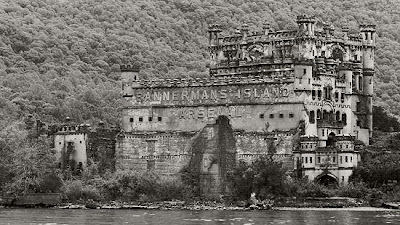 I live by the Hudson River and I see it out in the middle of the river...it looks so cool, a castle just in the middle of all that water. My mom is always talking about it. I think it's restricted because I think military people use it now.